Bikeworks North. Our yard runneth over with bikes. 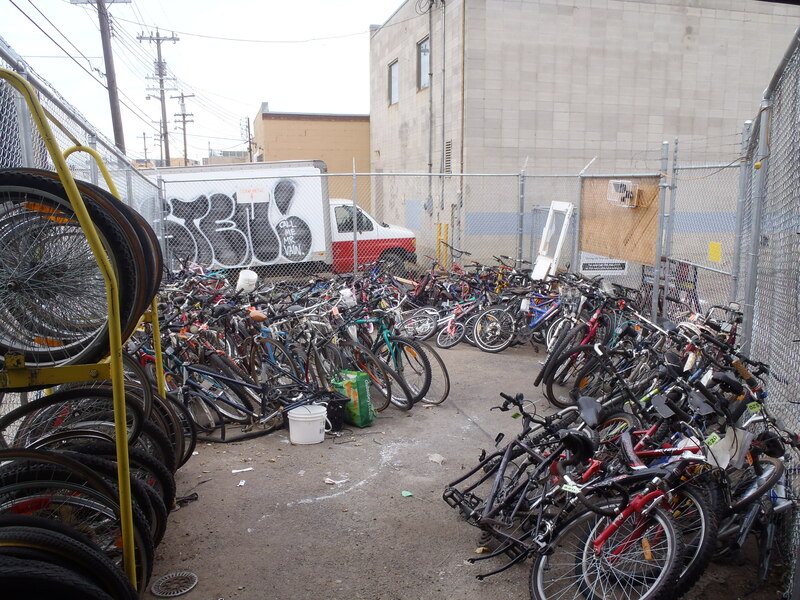 Both Bikeworks locations have a surplus of nuthin’ fancy bikes so we’re having a sale. Specially marked bikes are priced at $10 to $50. All kids bikes are $5 unless otherwise marked. 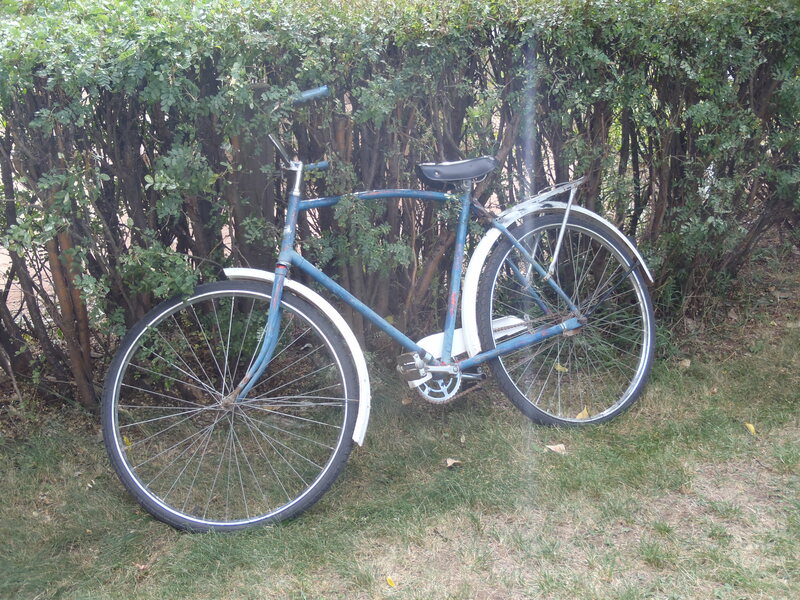 If you’re looking for a winter beater or a bike that most thieves wouldn’t look twice at come on by. These bikes have not been tuned up and are sold as is. Last week we had our first snowfall of the season. Although it didn’t amount to much and melted quickly it was like receiving a letter from Winter’s lawyer instructing us to Cease and Desist all summer activities. Never fear, the cycling will continue as it is an all-season activity. Winter may disagree with me on that point, but the growing numbers of cold weather cyclists will soon convince him otherwise. However, this little snowfall has given me the motivation to finish up my backlist of summer blog posts. 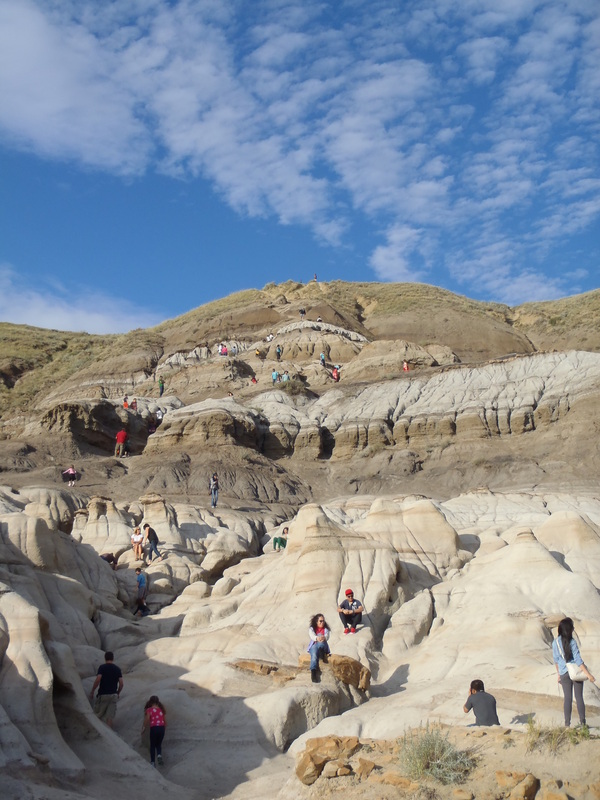 The Labour Day long weekend saw most members of the Tuckamoredew household visiting the town of Drumheller in the Alberta badlands. 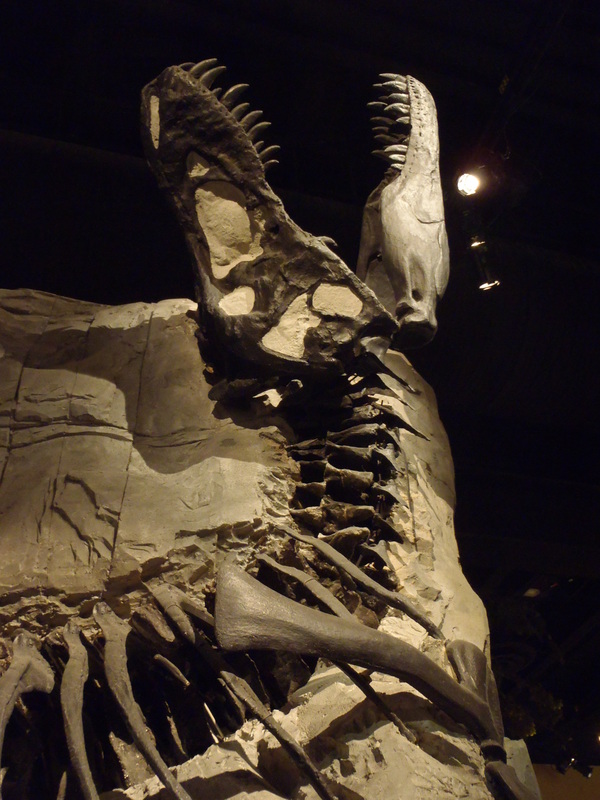 Originally established as a coal mining town, the town is now famous for the Royal Tyrrell Museum of Paleontology, a center of research that hosts a collection of more than 130,000 fossils. Here’s a friendly word of advice dear readers: If you ever visit the museum (and you should, it’s excellent) try not to do it on a long weekend along with hundreds of other visitors, and most definitely try to avoid dragging a cranky 4 year old boy through aforementioned crowd. 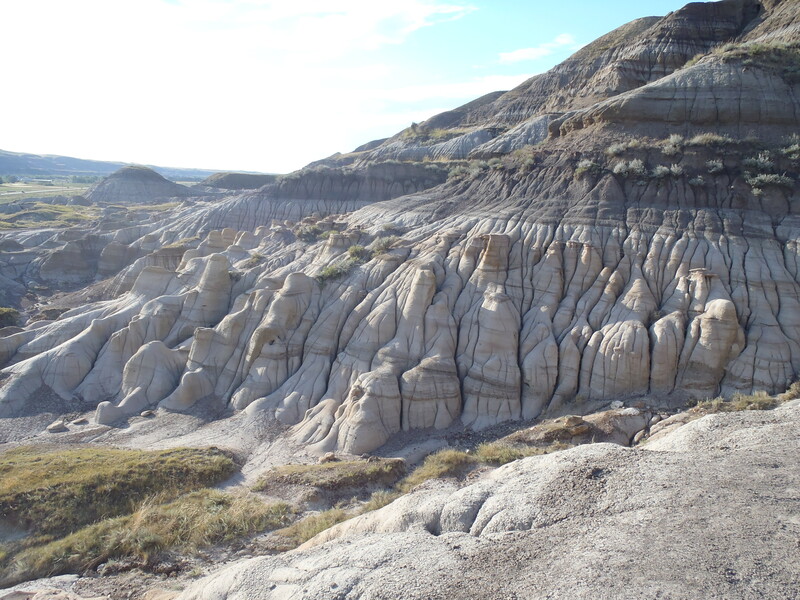 The town sits in the valley cut by the Red Deer river, and as you drop down from the prairie above you enter a fantastic arid landscape, a 360 degree geology lesson. This terrain has been used to good effect in television and movies, notably Clint Eastwood’s “Unforgiven”. I would like to have spent a good deal of time exploring the area by bike but the family nature of the trip meant a lot automotive tourist activities. 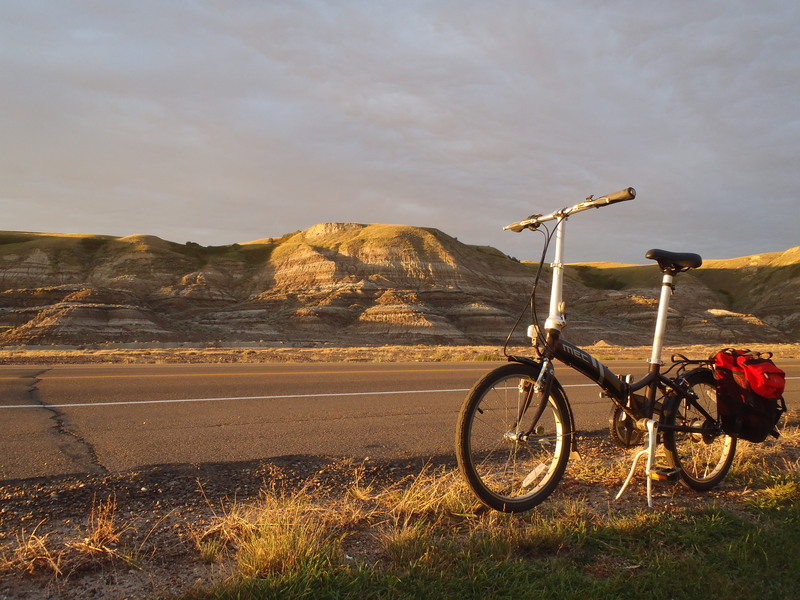 Also, the logistics of this trip meant I was only able to bring my wife’s MEC Origami folding bike. I did get to ride it some and tested it out on some badlands trails. I am pleased to report that it performed quite well, even when pulling my boy through rough terrain in a Chariot trailer. The first major stop was of course the museum. 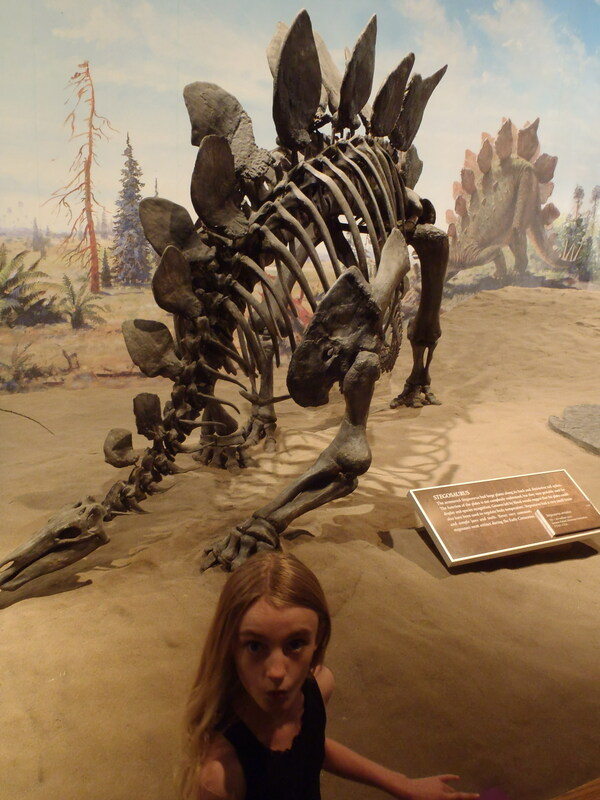 The usual suspects were present in the museum. 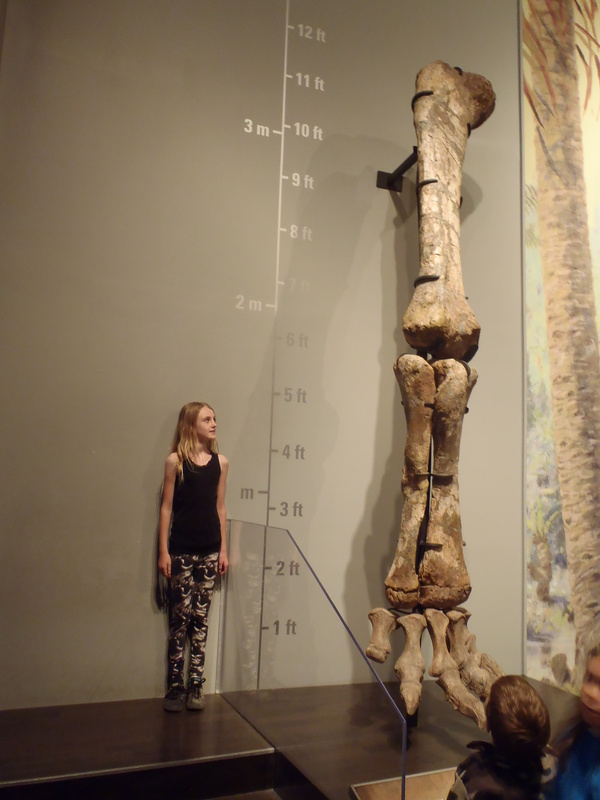 My daughter providing a comparison of scale. In addition to the Paleontology museum we checked out the Atlas Coal Mine National Historic Site, an interesting window into the industrial past. The tour guides were lively and entertaining, regaling us with tales of scurrilous coal marketing, flatulent miners and hard working wild west type antics. I was interested to see the staff gliding about their business on a number of old bicycles. 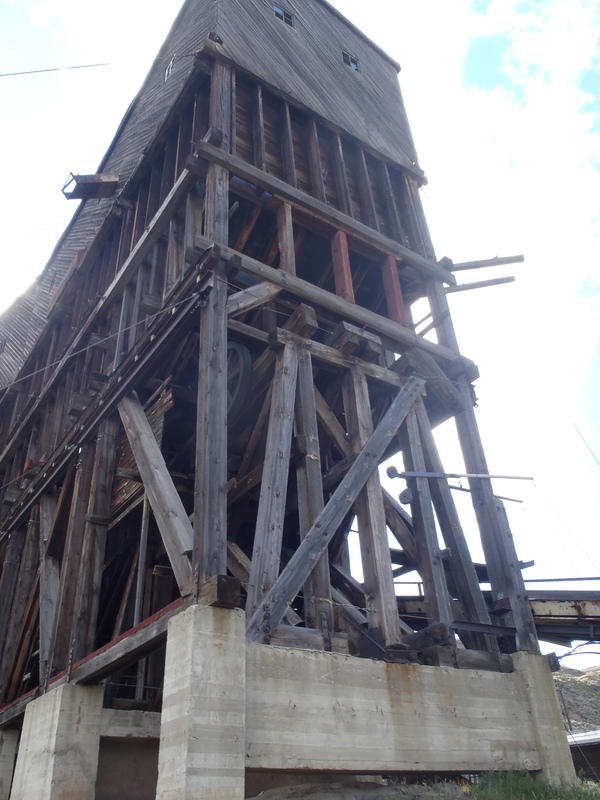 This is the last remaining wooden coal tipple in North America. The tipple was used to store, sort and deliver the coal to the freight trains. Our guide for the tour through the tipple provided a vivid description of the difficult working conditions for the workers of the time. 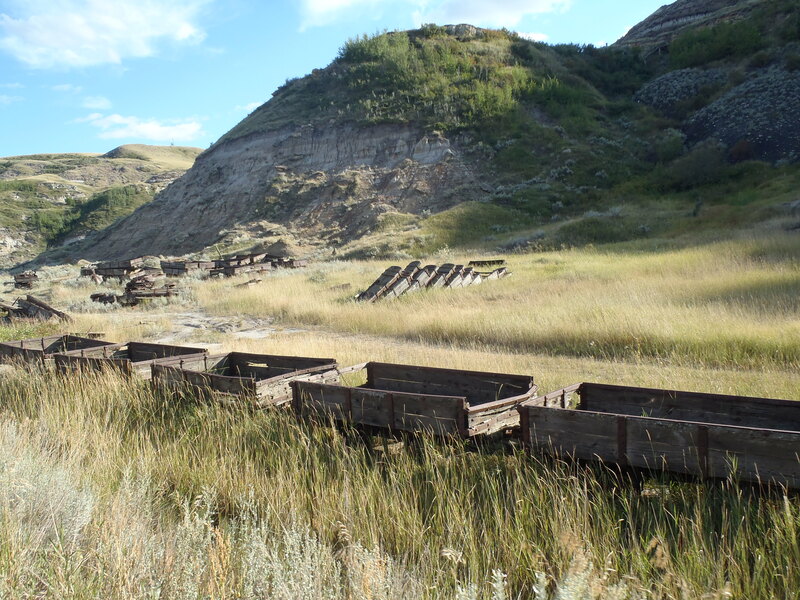 A graveyard of old coal mine carts. Finally, no trip to the badlands is complete without seeing the hoodoos. These striking spires are formed when a cap of hard rock somewhat protects the softer rock underneath from erosion. My daughter showed her paternal genetic heritage by scampering to the top of the valley in my more cautious company. The rough trail to the top was somewhat alarming, with precipitous drops completely lacking any safety railing. I was acutely aware of my transmogrification into concerned parent as it would not have bothered me in the slightest when I was a youth. I was aghast at the young children being allowed to crawl around the perilous terrain. Yes, I am but a shadow of my cliff-crawling, rock-hopping childhood self. 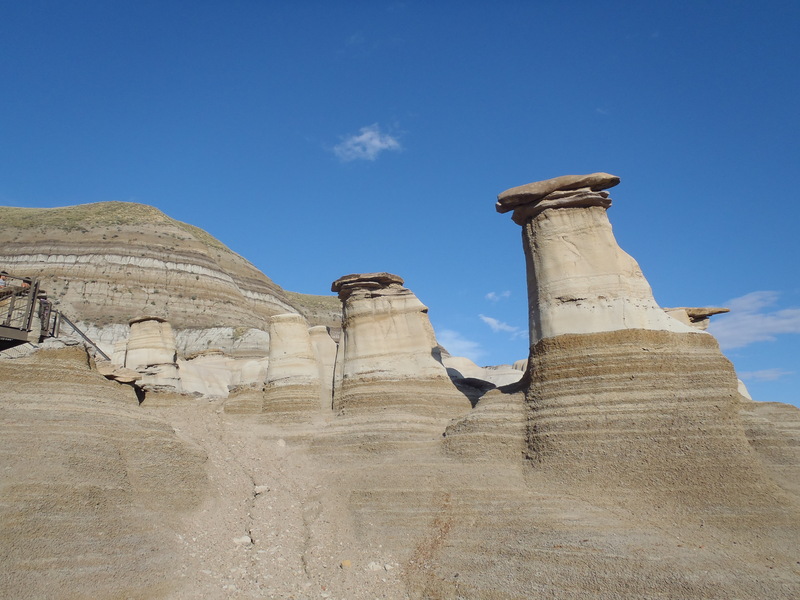 Hoodoos! These formations were protected from destructive idiot tourists by a fence. However, there was no shortage of fools climbing about the surrounding terrain. I was one of them and it was the most fun I had on the trip. TuckamoreDew saying farewell to Drumheller. Ah, Tron. An 80’s SF gem. Great visual style, the introduction of big screen computer graphics and a tolerable story (a point where so many SF movies stumble and hit their head on the coffee table). I can’t remember if the movie even played in the small town theater nearest to my rural home but I do know that I didn’t get to see it. This crushing pre-teen disappointment was slightly mitigated by reading the novel based on the movie. That’s kind of pathetic, I know. Fortunately, I was later able to see the movie through the miracle of VHS. Even if you haven’t seen the movie you are likely aware of the famous light cycle scene. It’s memorable and even though they’re some form of motorbike rather than bicycle it’s still fantastic two-wheeled fun. 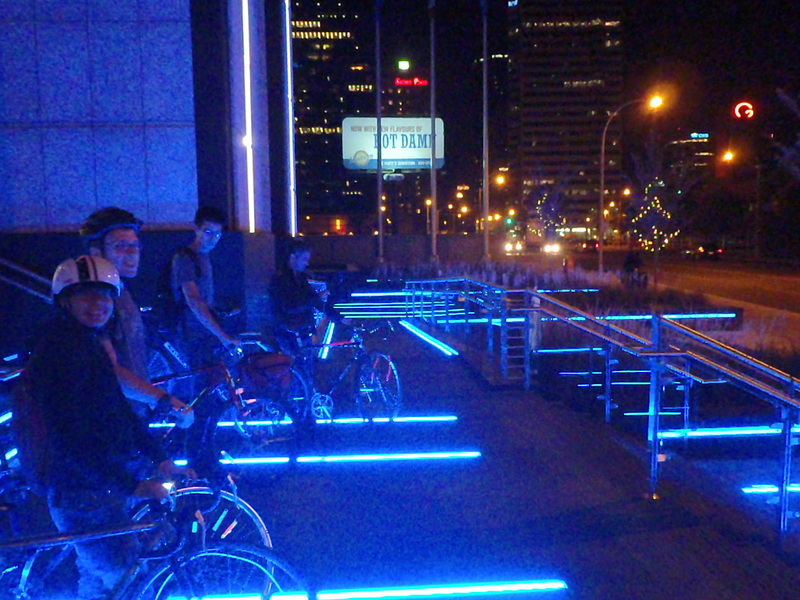 A Tron themed night ride could only be a good thing. 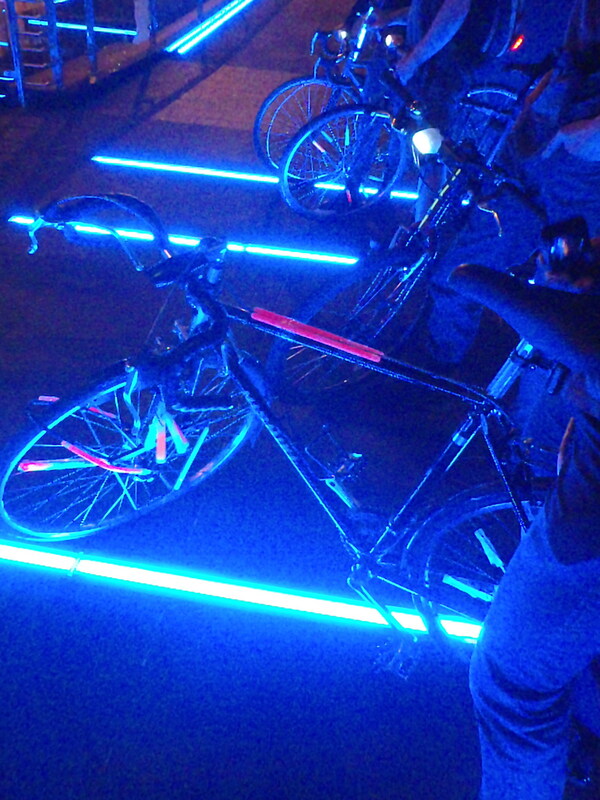 The Tron ride came at the end of a stupidly busy Saturday. I filled in at Bikeworks North for a couple of hours and then raced off to busk the incoming crowd of the football game. 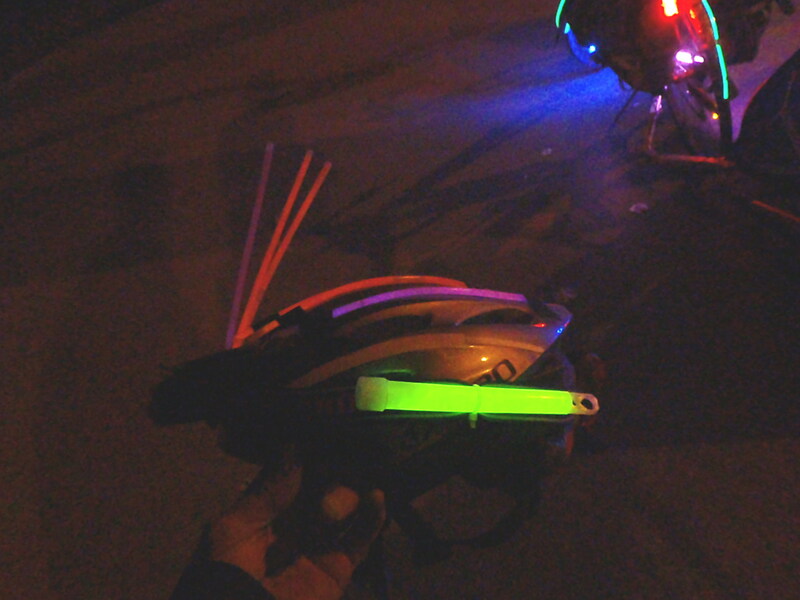 After that I had to scurry home to adorn my bike and helmet with glowsticks and stuff a quick bite of food in my face. To go on the ride I had to skip busking the outgoing crowd at the game, a decision that had caused me no little agonizing on the previous days. Oh, the lost busking dollars! Still, dusk found me at the North Shop with about a dozen other riders. 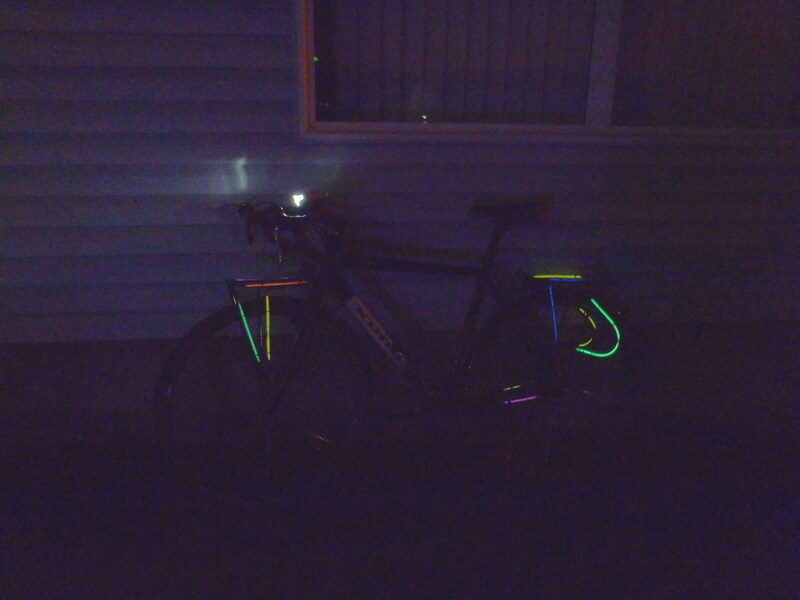 Glowsticks were much in evidence. 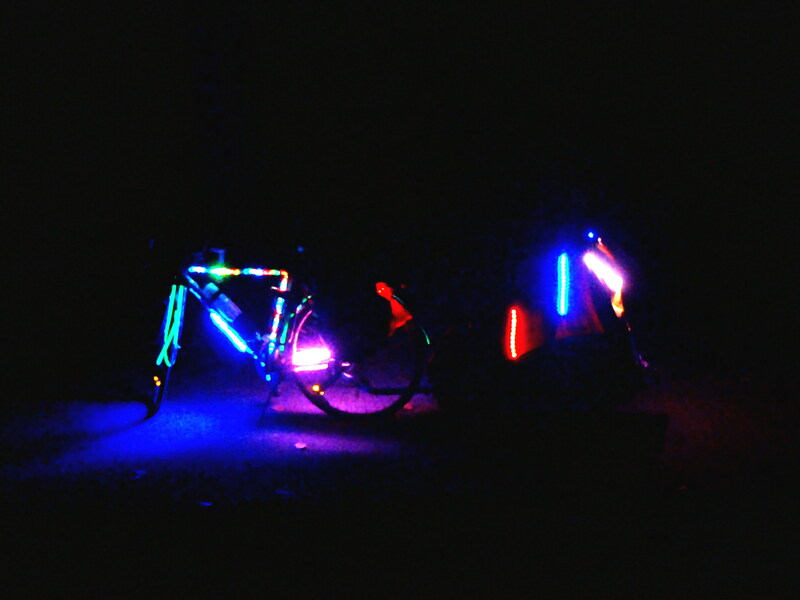 Chris was riding his famous and dazzling electrified light bike and pulling a glowing trailer equipped with a sound system. 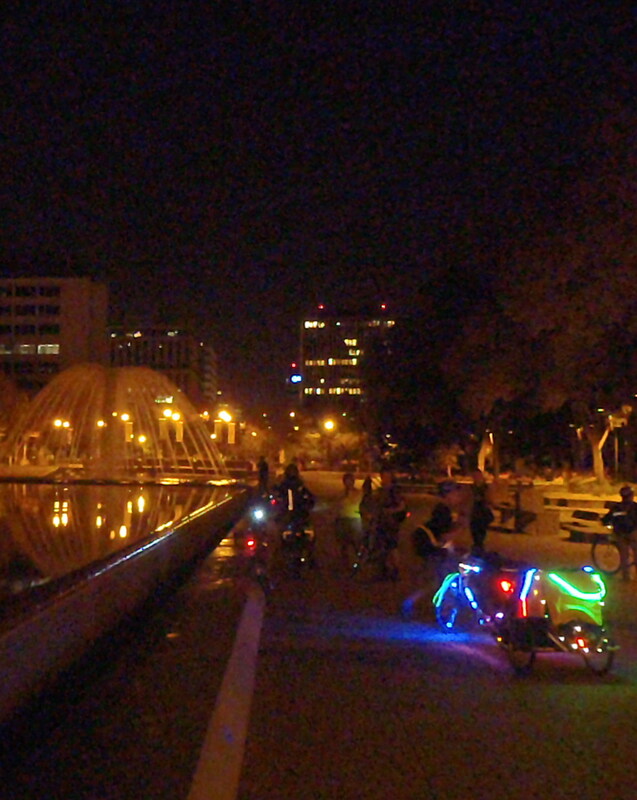 We made quite a spectacle as we cruised through the city. Our rambling tour took us past the crazy traffic around the football stadium, through residential neighbourhoods and into the river valley trails. There was a stop at the legislature, some zippy downtown riding with a little parkade excursion, culminating in a stop at the new building that had inspired the ride in the first place. We had shed a few riders by this point. Too bad for those who missed the blazingly electric setting. I was disappointed that nobody wanted to go back to BWN for the planned screening of the movie and 80’s video games. C’mon people! It was only 10:30PM on a Saturday! 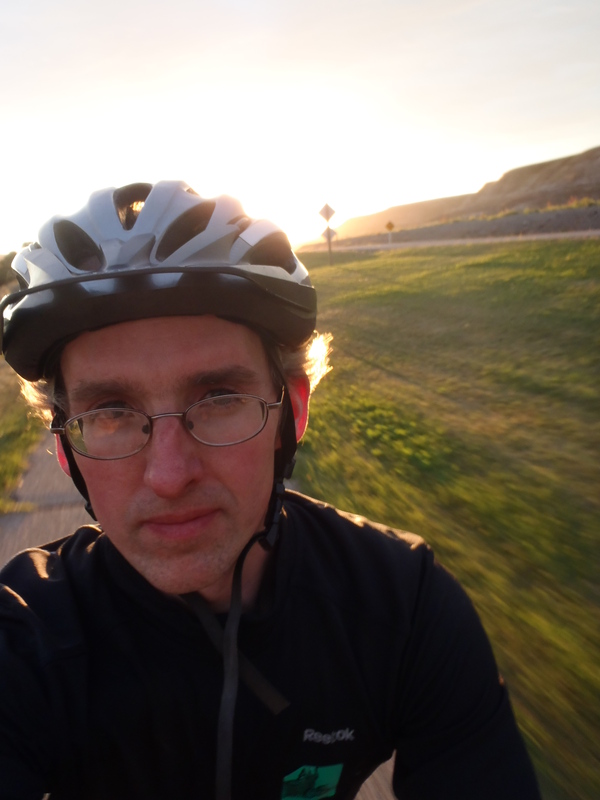 In any case, it was a great ride and many thanks to Coreen for organizing and leading it. My helmet may not have been true to the movie but it was pretty light-tacular. I sensed the ominous presence of the Master Control Program when we arrived at the legislature grounds. The end of the ride. 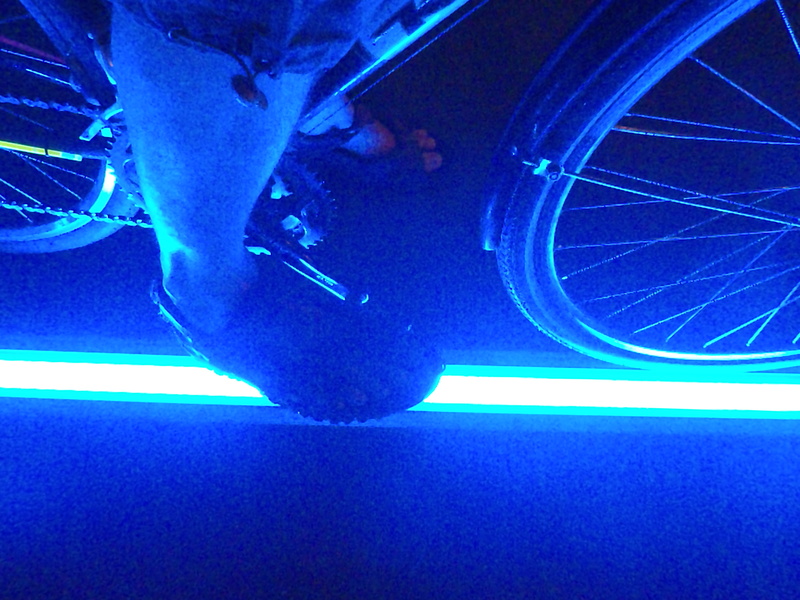 Very Tron. Or maybe Max Headroom. Just ridin’ my light-cycle. No big deal.